You will find below the horoscope of Katja Schuurman with her interactive chart, an excerpt of her astrological portrait and her planetary dominants. If you know the time of birth of Katja Schuurman, we would appreciate it if you would send us your information with your source, at stars@astrotheme.com. To thank you for contributing to the enhancement of our astrological database, we shall be glad to send you the astrological portrait (34 pages) of this celebrity. Horoscopes having the same aspect Mercury trine Pluto (orb 1°13'): Brad Pitt, Renée Zellweger, Drew Barrymore, Enrique Iglesias, Serge Gainsbourg, Christy Turlington, Mark Wahlberg, Johann Sebastian Bach, Lenny Kravitz, Patrick Bruel, Lara Fabian, Tyler, The Creator... Find all the celebrities having this aspect. Horoscopes having the same aspect Mercury sextile Neptune (orb 1°34'): Brad Pitt, Jennifer Aniston, Bill Clinton, Jimi Hendrix, Drew Barrymore, Christy Turlington, Michael Schumacher, Margaret Thatcher, Kesha (singer), Claudia Schiffer, Ernest Hemingway, Grigori Rasputin... Find all the celebrities having this aspect. Celebrities clicked on in real-time: 576,124,781 times. Katja Schuurman (born February 19, 1975 in Utrecht, Netherlands) is a Dutch television and film actress, VJ, singer, and television personality. Katja grew up in Bunnik as the eldest daughter of a Dutch father and a Chinese-Surinamese mother; she has a younger sister, Birgit, who went on to become a celebrity as well. Schuurman made her acting debut in 1992 on the television series Uit de school geklapt. Two years later she resurfaced in the RTL soap Goede Tijden, Slechte Tijden (GTST) as Jessica, the eldest niece of one-time angry neighbour Govert Harmsen. Katja's star immediately rose to fame. With two other characters from GTST she formed the spin-off girl group Linda, Roos & Jessica. Here are some character traits from Katja Schuurman's birth chart. This description is far from being comprehensive but it can shed light on his/her personality, which is still interesting for professional astrologers or astrology lovers. 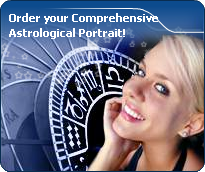 In a matter of minutes, you can get at your email address your astrological portrait (approximately 32 pages), a much more comprehensive report than this portrait of Katja Schuurman. Warning: when the birth time is unknown, which is the case for Katja Schuurman, a few paragraphs become irrelevant; distributions in hemispheres and quadrants are meaningless, so are dominant houses and houses' accentuations. Therefore, some chapters are removed from this part. The predominance of Water signs indicates high sensitivity and elevation through feelings, Katja Schuurman. Your heart and your emotions are your driving forces, and you can't do anything on Earth if you don't feel a strong affective charge (as a matter of fact, the word "feeling" is essential in your psychology). You need to love in order to understand, and to feel in order to take action, to the detriment of a certain vulnerability against which you should learn to fight. Cheers for communication and mobility, Katja Schuurman! The predominance of Air signs in your chart favours and amplifies your taste for relations and for all kinds of short trips, whether real (travels) or symbolic (new ideas, mind speculations). You gain in flexibility and adaptability what you lose in self-assertion or in pragmatism. Fire's qualities are not very present in your chart, with only 8.37% instead of the average 25%, which means that you may lack warmth, enthusiasm, conquering spirit, or energy. You may look indifferent to others, with almost no desire, no joy of life or no enterprising ability. Actually, it is not true, but you should let go, force yourself to be more daring, and show your amazement as well as your vitality. You certainly have as much energy as others, you just need to release it, and it is up to you to display more of it, since it will be all to your benefit: shout, sing, pull faces, dance! That's the right mean for you... In the end, you'll never be accused of being sad, phlegmatic or a killjoy! The Mutable mode is the most emphasized one in your natal chart, Katja Schuurman, which indicates a mobile character that is curious and thirsty for new experiences and evolution. You are lively and flexible, and you like to react quickly to solicitations, but don't confuse mobility with agitation, since this is the danger with this configuration - and with you, stagnation is out of the question. Security doesn't matter as long as you are not bored. You optimize, you change things, you change yourself... all this in a speedy way. After this paragraph about dominant planets, of Katja Schuurman, here are the character traits that you must read more carefully than the previous texts since they are very specific: the texts about dominant planets only give background information about the personality and remain quite general: they emphasize or, on the contrary, mitigate different particularities or facets of a personality. A human being is a complex whole and only bodies of texts can attempt to successfully figure out all the finer points. You are a “free-thinker”, Katja Schuurman, and you tackle problems with a swift and efficient mind. Freedom, progress and originality are your driving forces. You are resolutely future-oriented and with ingenuity and inventiveness, you reform what is outgrown and you constantly innovate: psychology, computer sciences, new technologies... have almost no secret for you. Your human and idealist qualities are obvious, you are a very pleasant and interesting interlocutor, even though your rebellious and revolutionary side may be criticized. Indeed, you seem to be driven by a strong argumentativeness: you seldom share your friends' views and, although you may come across as obstinate, intransigent and unpleasant, you do not hesitate to speak the truth! Instead of causing sudden break-ups with your friends, it is advisable that you express your creative potential more persistently whenever your nervous tension is too high. Compassion and self-sacrifice: you are fond of this romantic mode and you are willing to express your feelings, the intensity of which is unlimited, Katja Schuurman. With excitement and imagination, you dream your amorous relationships as much as you actually live through them. The line between the concrete world and your huge hopes is so tenuous that you don't know anymore where it is, although your particularly rich sensuality prompts you to experience your feelings concretely. You want to share communion and passion with your partner. The lyrical flights of your feelings break from your heart as waves that you do not attempt to control because they give you a real, almost voluptuous and carnal joy. You give a lot – sometimes too much - without reservation, almost without propriety, totally revealing your vulnerability during your amorous exchanges because you are sure of the quality and the might of your feelings: they are so powerful and overwhelming that you are aware that nothing can resist them. Katja Schuurman, you are so resistant and so solid that you are able to cope with any challenge, any ordeal. You behave with persistence, rigour and discipline. You are so obstinate and patient that no effort is impossible to you, as if sensitivity and emotions were unable to divert you from your goals. With calm and lucidity, even coldness, you face up to things and you plan on a long-term basis. Nothing and no one can prevent you from fulfilling your responsibilities. You are a rock, a hard worker, and your iron will equals your resistance to blows. Your practical sense is at the service of your ambition which is real and energetic, even though it may not be obvious. Sexually, you are active and vigorous. If you show more warmth, you may become an excellent lover; indeed, being demonstrative is not your major concern. This text is only an excerpt from of Katja Schuurman's portrait. We hope that it will arouse your curiosity, and that it will prompt you to deepen your knowledge of astrology, as well as to visit and use the wide range of free applications at www.astrotheme.com.